People come from all over Europe and beyond to Sitges to eat, drink, eat - and to enjoy its magnificent beaches. When we visited Sitges last year, we knew what Barcelona had to offer. 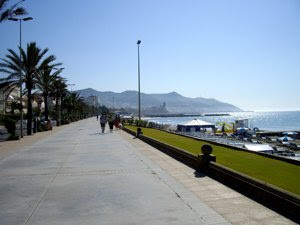 Sitges is however in direct contact with the Mediterranean. This year we could just cross the street and take a swim, whereas in Barcelona you had to take a metro and a 10 minute walk. 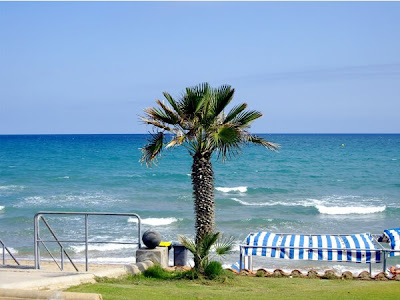 Sitges is one city with four magnificent beaches. We start from the southern part of the city, i.e. from the southern end of the beach to Carrer de Prat de la Riba. Here there are mainly exclusive villas and condominiums and a few very good hotels just by Passeig Maritime and the beach, as the Hotel Terramar. If you would like to take a drink or have a bite, you will have to visit the hotel or walk into the city. The beaches are narrower than those closer to the city, and do not have the fine sand as further in. The good thing here is that the beaches are less overcrowded and child friendly. From Carrer de Prat de la Riba to the cliff there are two large and one small beach. 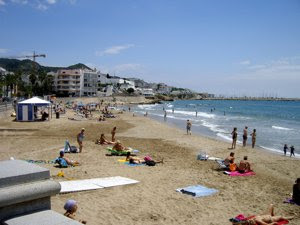 These beaches are wide and very popular, as they are by the main city centre with restaurants, hotels and shops just by. This means that they are overcrowded, and if you do not live by the beach (as we did), you will have to endure the company of sun hungry men and women from all over Europe. One of the beaches is a gay/gay friendly beach. If you wonder which, look for the beach with the men. The others are primarily mixed beaches, but as the liberal city it is, gay couples may enjoy a friendly atmosphere everywhere. Closer to the church there is a small, but very wide beach. When we were there, this was a venue for a sand volley ball tournament. Just north of the old city you find a short but wide beach. Here you find less youths, gays, and singles and more couples with kids. Here the beaches are interrupted by large cliffs and you may walk further down to find other and smaller beaches. Here you find the only nudist beach as well. I do not like to stay on an overcrowded beach, but I still like to get a snack and drink. Do as we did, rent a hotel room on the beach front, in the city centre. Then you can just slip into your swimming gear, leave your hotel room, have swim, and go back to your room to change. A snack may be enjoyed on the beach or in one of the many bars and restaurants in the streets near by.